This book is the first-ever publication to deal exclusively with the subject of promotional knives. It contains over 400 detailed color photos and explores over 100 years of advertisements stamped into the sides of knives. Extensive captions, containing accurate pricing information, and text give the reader the background information necessary for evaluating collectible advertising knives. As if that weren't enough, evaluative schemes are also included and future trends discussed. 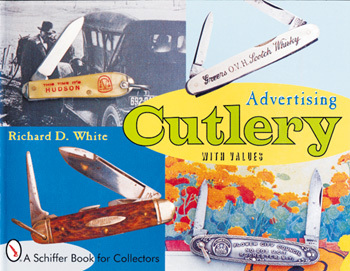 This book is a must for all those interested in knives, advertising, and collecting in general.